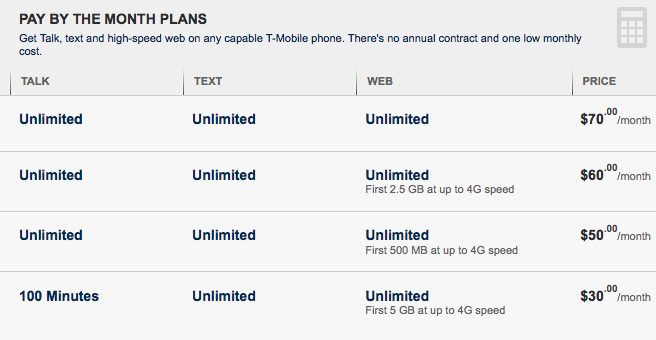 T-Mobile offers an extremely competitive monthly no-contract plan: $30 for 5GB of 4G/LTE data, 100min. talk, and unlimited text. With hotspot, and after 5GB, data is rate-limited to 2G speeds. It’s such a great deal, T-Mobile is keeping it hush, pushing it to the fine-print, and ordering hits on anyone shouting it from the streets. This plan is an online-exclusive and requires careful steps to acquire. But worth. $30 for 30MB data and 1500min. talk/text. $60 for 2.5GB data and unlimited talk/text. $70 for unlimited data, unlimited talk/text, and no hotspot. $25 for 250min. talk, unlimited text, and 0MB + $5/50MB data. $40 for 500min. talk, unlimited text. 200MB + $5/50MB. $60 for unlimited talk/text and 2GB + $10/1GB data. If you’re one to chatter on the phone for hours, you can stop reading here, as the $30 plan only offers 100 minutes of text (though if you’re using AT&T, I’d consider the switch). New activations only so if you’re already a T-Mobile customer, you may have to get a new number. Other customers can port their number into T-Mobile when activating online. T-Mobile claims that this plan is a Walmart exclusive and that you must buy a T-Mobile Walmart phone kit, however, that’s a lie. They state this on their website, they stated me this at Walmart, and they stated me this when talking to T-Mobile customer representatives on the phone/chat. T-Mobile stores themselves will usually ‘fess up though. Here are the steps to get the plan. You will need a T-Mobile phone to activate the plan online, or an IMEI serial number of a T-Mobile phone. If you are switching to T-Mobile, it might be safe to say you will buy a T-Mobile phone. If you are already on T-Mobile, well, that’s moot. If you are trying to use it on a non-T-Mobile unlocked phone, you can buy a cheap phone just for the number. The plan will be worth buying a throwaway phone. For me, I had an iPhone 5 during the summer (I found my unlocked AT&T Galaxy S2 wasn’t capable of 3G/4G data on T-Mobile, and did not like the HTC One/Galaxy S4/Nexus 4). Then head over to T-Mobile to activate your SIM card on a prepaid phone plan. Follow the steps, and yes, I know T-Mobile’s web forms are totally jank, to activate. If you are considering porting your phone number from another service, there will be an option to do so. Existing T-Mobile customers should get an error if trying to port. I tried calling T-Mobile to port my number manually, but what they did was activate my new SIM card on my existing line and deactivated my old one, which was not what I wanted. I had to buy another activation kit. Once you get to this portion, the $30 plan should be an option. It should say 100mins of talk, 5GB of data, unlimited text, and new activations only. We’ve gotten this far, click that victory radio button, and the plan should now be yours. Pay the $30 to fill the account (I used a T-Mobile $30 refill card), set up auto-pay if you wish. The plan has been up for almost a couple years, but do it now before too many people notice and they rescind the plan! Enjoy your five gee-bees per month for cheeps!